. Often called "The Arc de triomphe of the East", Charminar was built in 1591 by Mohammed Quli Qutb Shah and is a beautiful structure with four intricately carved minarets. Enormous in its size, this imposing monument exudes a charm that is more than 400 years old!". 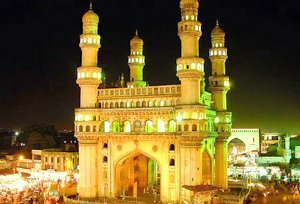 Charminar is surrounded by markets and many other structures which adds to its grace. Shahali Banda, Laad Bazar, Kali Kaman and Patthar Gatti flank charminar on its four sides. The structure here show mixed Indian and Mughal architectural styles. From glass bangles to pure pearls, and from handicrafts to gun metal showpieces the City offers a host of articles to the tourist. The favorite place for almost every tourist is Laad Bazaar, a famous bazaar adjacent to the historical Charminar. The accent here is on color, glitter and sheen. This is true of not only bangles but everything at Laad Bazaar. The Mehboob Chowk, a torpid looking quadrangle with an imposing tower in the middle marks the end of the Bazaar. Situated at an altitude of 1722 ft; Hyderabad has salubrious climate with low humidity during the greater part of the year. In April and May temperatures may go up to 40 degree centigrade but during the rest of the year the climate is temperate and during December and January it is cool. Adjacent to Charminar is the Mecca Masjid, one of the largest mosque in the world (accommodating up to 10,000 worshippers) Construction began in 1614, during the reign of Sultan Mohammed Quli Qutub Shah, but wasn't finished until 1687, by which Mughal emperor Aurangzeb had annexed the Golconda kingdom and completed this Masjid in 1693. It is a grand edifice with a huge courtyard which can accommodate nearly ten thousand men at prayer. Tavernier has provided a graphic description of the mammoth boulders cut to size and carted for use in the building of the mosque. The minarets look rather stunted in comparison with the grandeur of the whole massive structure. But it looks more Mughal then Qutub Shah in its perfect granite finish and vast courtyard. A particular stone brick in the mihrab is believed to have been brought from Mecca. The name is derived from the Grand Mosque at Mecca on which it is patterned. The hall measures 67 mt. by 54 Mt. and is 23 Mt. in height. Fifteen arches, five on each of the three sides, support the roof. A high wall to provide the Mehrab blocks the western side. Each of the two octagonal columns on either side are made out of a single piece of granite, It took about 8000 Masons and laborers and 77 years to complete. At each end are two huge octagonal columns made out of a single piece of granite each topped by an arched gallery that is crowned by a dome. Other Mosques - The other two mosques-the Jami Masjid and the Toli Masjidare small and modest structures. 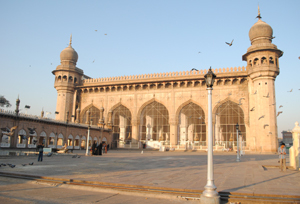 Mohammed Quli Shah built the Jami Masjid in 1592, after founding Hyderabad. ]Muse Khan, a supervisor of works at the Mecca Masjid, levied a damri for every rupee spent on the building of the Mecca Masjid. With these collections he built the Toli Masjid, near the Purana Pul. Two buildings, the Badshahi Ashur Khana and Darul Shifabuilt in 1594are much dilapidated and in need of large scale repair. The city straddles the Musi river which, in 1908, had caused much destruction by flooding the city. Under the supervision of Indias greatest engineer Sir M. Vishweshvarayya, two large reservoirs, Osman Sagar and Himayat Sagar were constructed to save the city from devastation by floods in the future. If there is some time left, a visit to the Nehru Zoological Park is recommended for a short lion safari and observing the wild beasts moving about freely in their expansive compounds. The crocodile hatchery is very informative for the young and the curious. One of the most visited places in the city is the Salar Jung museum. The name originates from the Telgu words "Golla and Konda" or "Shepherd's Hill" after neighbourings Warangal. A clap under the canopy of the Fateh Darwaza can be heared at the far summit palace. Famous KOHINOOR DIAMOND of the British Crown was mined from this area. This legendary citadel built on a 120 meter high granite hill is surrounded by battlemented ramparts. Once the capital of the Qutub Shahis, the fort is enclosed within eight massive gates studded with large pointed iron spikes. One of the most remarkable features of this fort is its advanced acoustics. The forts acoustics are remarkable: sound of hands clapping in the Grand Portico can be heard in the Durbar hall at the top of the hill. Also, the design of the ventilation reveals the brilliant planning of the architects. The ventilation is designed to let in a flow of fresh cool breeze which is a respite from the heat of summer. An hour-long light-and-sound show is held daily except Mondays. This massive fort is 11 km in perimeter and its walls are 15 to 18 ft high. The whole fort is built in granite and is flanked by 70 ramparts and 8 huge gates. Previously the whole fort was surrounded by a deep gorge but slowly this was filled up. While entering from the main gate of the fort, if one claps below the dome, echoes are heard in a Darbar hall some 128 meter away. The majestic and imposing monument which lies on the Western outskirts of Hyderabad city - Golconda Fort, unravels with it the 400 years of the rich cultural heritage of this city. Outside the Fort are two separate pavilions built on a rocky eminence - the Taramathi Gana Mandir and the Premathi Nritya Mandir from where the legendary sisters Taramathi and Premamathi resided. They gave their performance on a circular dais atop a two-storied structure, the Kala Mandir, which was visible from the king's durbar (king's court) on top of the Golconda Fort. Although in a dilapidated condition, efforts are on to revive the glory of the Kala 'Mender by organizing the Deccan art festival annually. Close to the fort are the beautiful domed monuments, the Qutb Shahi Tombs built with Islamic architecture.